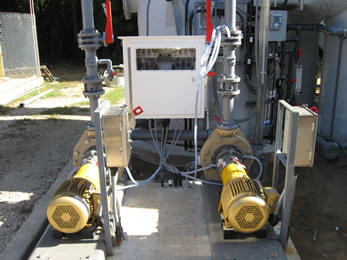 Indusco Environmental Services, Inc. provides scrubber recycle pumps & liquid transfer pumps. IES supplies each system with the best recycle pump for the application considering the chemicals, concentration, percent solids, and temperatures involved in the process solution being pumped. The configuration of the recycle pump is based on physical space, type seal, water flush, or product flush. The construction of the pumps can be cast alloy, fiberglass, and thermal plastic materials. kid system. Skid mounted systems offer the greatest value because there is no on-site assembly required. The skid assembly comes ready to install. 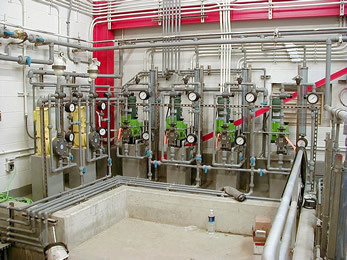 Typically, the only field connections required is the electrical (power and signal) connections and liquid piping to the process. Meter pumps are used in many air pollution control scrubber applications where water is not able to provide the required chemical reaction to remove the contaminate compounds. Many scrubber systems require chemicals to be used to react and absorb the targeted pollutants. To introduce the chemical to the scrubber system liquid solution chemical metering pumps are normally used to dose the proper amount of scrubber solution reagents. The chemicals used in most of these applications are reactive and in many cases highly corrosive. 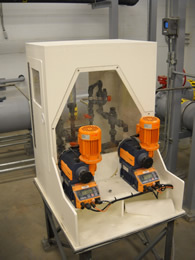 IES supplies metering pumps based on the type chemical, concentration of chemicals, required flow capacity (gph), pressure required, and customer preference. 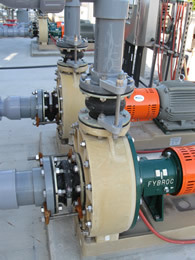 The meter pumps used are typically diaphragm, hose, or tubing types. These pumps provide dosing of chemicals into the scrubber liquid solution by means of coordinated instrumentation system process control.